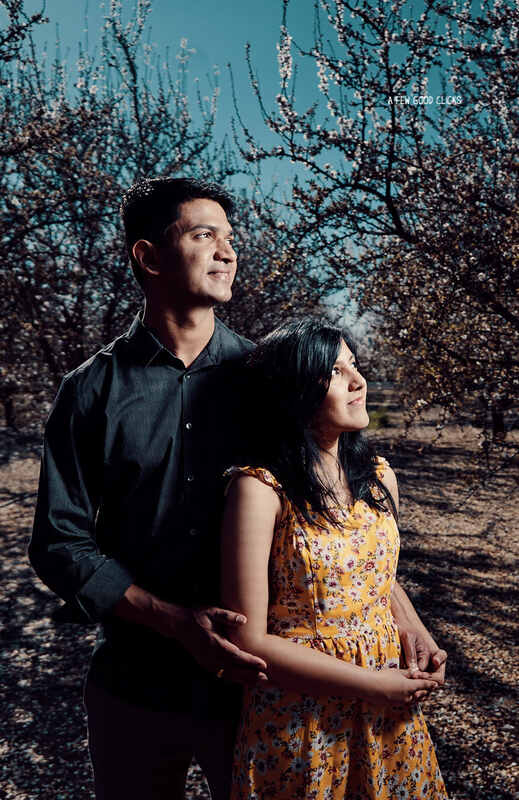 26+ Pre-Wedding Photos with different poses for an Indian American couple shot at Almond Farms in east Bay Area, California. 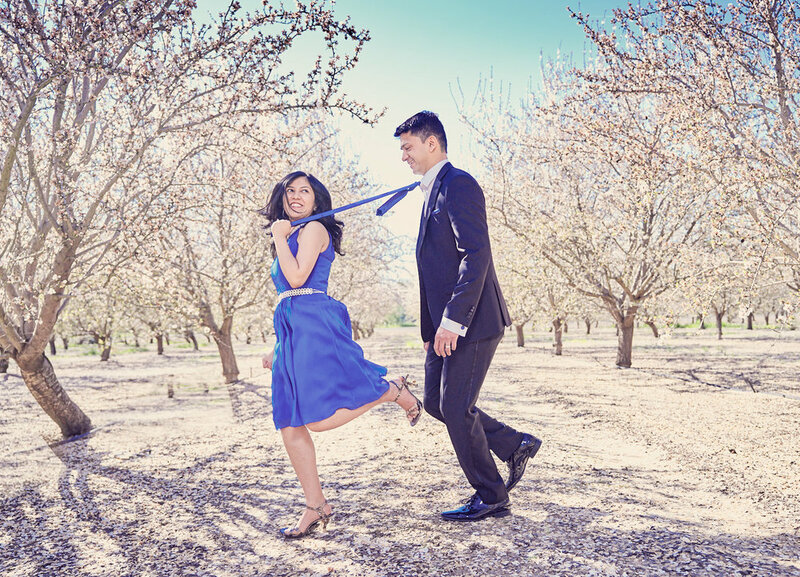 If I have one thing to obsess about this spring is the pre-wedding photos shot at Almond farm located just outside east Bay Area.The dreamy land of almond blossom can inspire anyone to be child like and let loose. The romance, the elegance, colour & contrast are just a few key ingredients to create some magical moments. 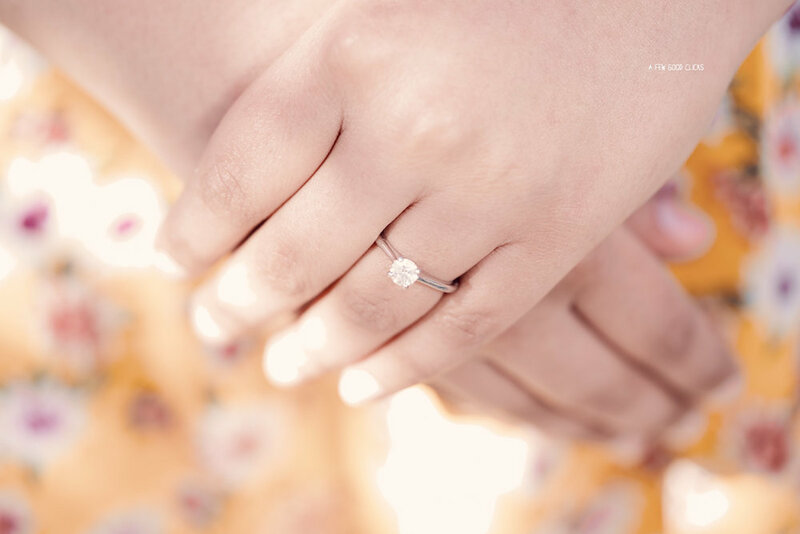 Keeping it simple with minimalistic style has always been my go-to style for engagement photography. Of course, I have nothing against using props but personally I feel, engagement sessions are about capturing the essence of your relationship and props, if not planned strategically may take away from your personality. With under two hours my belt, we tried a number of poses, ensuring it’s casual yet intimate. 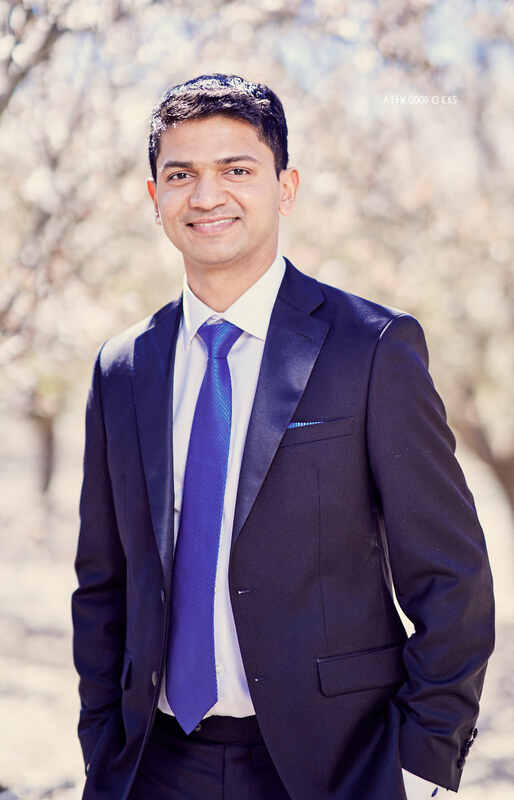 Big thanks to Divya ( the bride-to-be) for putting together a great ensemble including a royal blue dress for herself contrasting with Viraj’s ( the groom-to-be) smart suit. 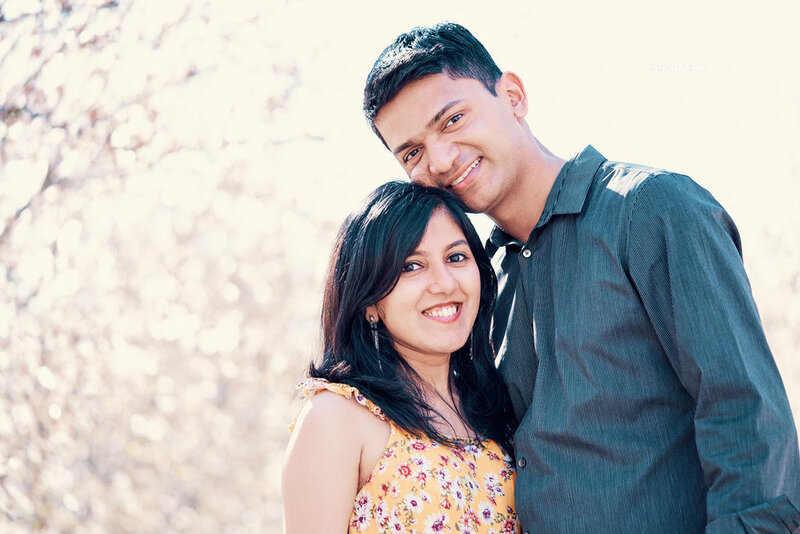 This gorgeous couple is ready to say "I do" in less than a week and I have been appointed to be their official wedding photographer...wooohoo! I knew it right from the day one that these two are my kind of people, the kind that is adventurous, open to ideas and relaxed. With myriad of emails and texts, we discussed about a number of locations and in the end settled on Almond Farms. One word of warning for people who are looking to get pictures in cherry or almond farms, please seek permission from the farm owners to avoid any trespassing issues. 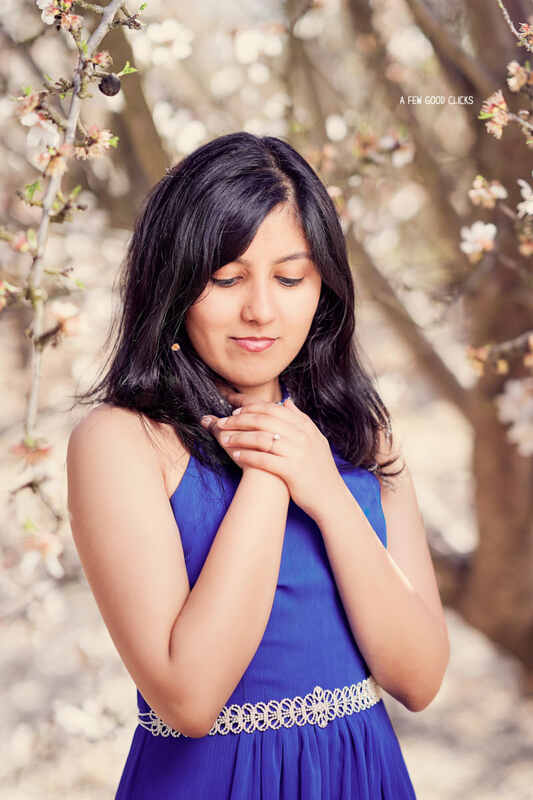 While they get all the preps in order, I have the white backdrop of spring flowers giving the cherry blossom vibes enough to keep me indulged in and plan their vibrant Indian wedding photography in Milpitas, CA . Shoot a picture through available foliage. Solo portraits - Works great for save the date invites. Separation in subjects help in creating versatility. 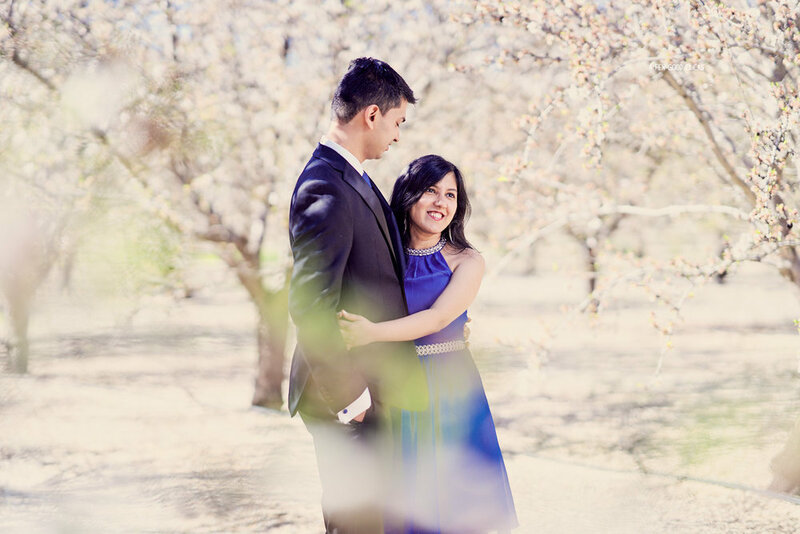 A simple hug | Ideas for couples engagement photoshoot poses. 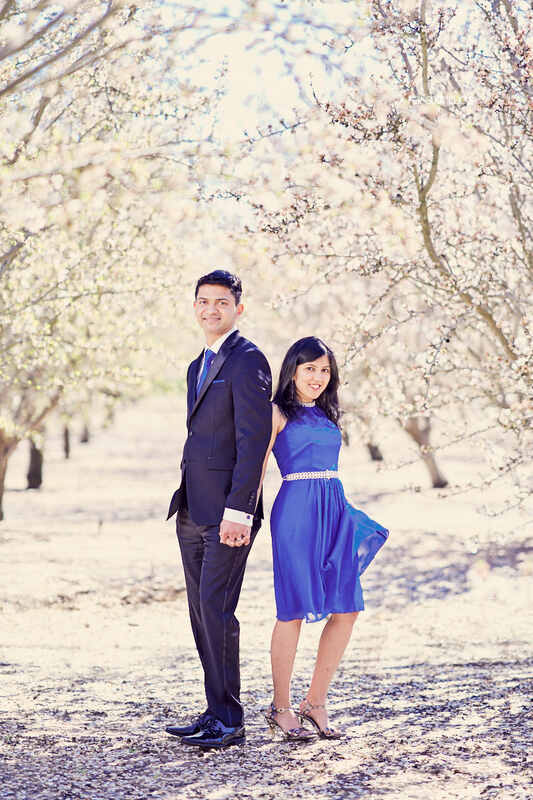 Pre-wedding Couples Photoshoot Ideas at Almond Farms. Use the dried leaves - Adds to the romantic scene of this magical location. Go as cheesy as you like in your pre-wedding shoot. Piggy back in couples shoot is fun . Get the groom-to-be to kneel down and the you don’t have to go through the awkwardness of lifting each other. Kisses and hugs | Ideas for your couples photography. The only prop I usually ask couples to carry is the ring, a family heirloom or something very simple that is pocket size. This is the first time I tried this pose and it worked flawlessly..I love this picture. Classic and perfect for save-the-date pose.